What about those rose apple trees on Hana Highway? We noticed them on our way in to Waianapanapa for our annual family week-long camping vacation. Rose apple trees, 'rosey apple' we call them. "We kids loved eating them," reminisced the Beau. Ravaged. No leaves. Brown. Dead. You could see the trees everywhere, many along the road and more scattered up the cliff sides. A few trees were in this condition last year, but this year? So much more devastation. 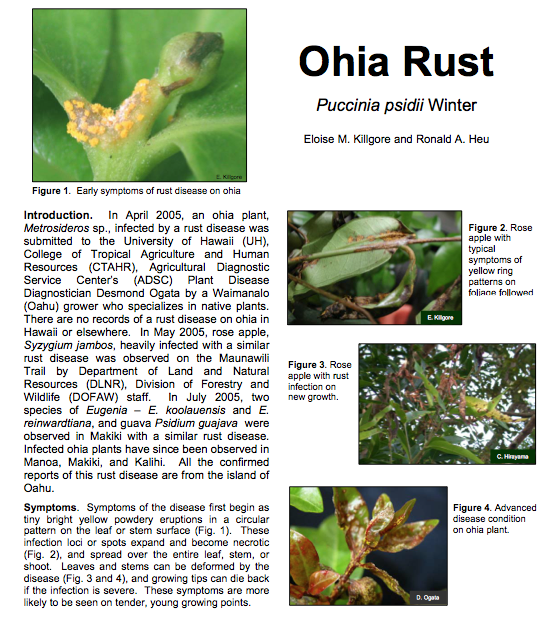 'Ohia rust', pronounced Forest. 'It's everywhere', added Kim. Although the disease is called ohia rust, luckily this strain hasn't touched our ohia. Only the rose apple. The State of Hawaii Department of Agriculture put out a New Pest Advisory back in 2005, when the disease was first spotted on O'ahu. "If a new strain of the rust arrives there is a very real chance that it will attack ‘ōhi‘a and cause the same level of damage as it did to rose apple. This could be devastating: ‘ōhi‘a makes up 80% of our native rainforest and is the keystone species in the watershed. In an effort to protect ‘ōhi‘a and our rainforest–the source of our water–the Hawai‘i Department of Agriculture is proposing a ban on the import of plants that could carry a new variety of the rust." 'We thought it might be part of an eradication plan," I murmured. "We couldn't have done such a good job of it," answered Kim. The rust spores travel with the wind, and spread is quick. 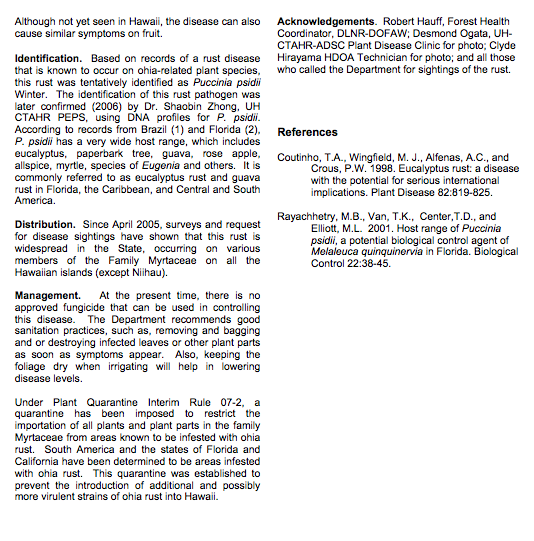 A Baseline Analysis of the Distribution, Host-Range and Severity of the Rust Puccinia Psidii in the Hawaiian Island, 2005-2010 displays results from road-side surveys of the Waihe'e Trail, but the report doesn't mention Hana Highway. Identification photos taken by the Starrs date back to 2007. Much of the road to Hana now looks like this photo, taken in 2008. Habit with Puccinia psidii at Huelo Hana Hwy, Maui. The big question is: what can you and I as regular citizens do to help? True, the rose apple is considered an invasive species, but a strain of the puccinia psidii could possibly arrive and target our beloved ‘ōhi‘a trees. First, Don't bring in myrtle plants or cut flowers, especially from other countries, without first checking with the Hawaii Department of Agriculture. 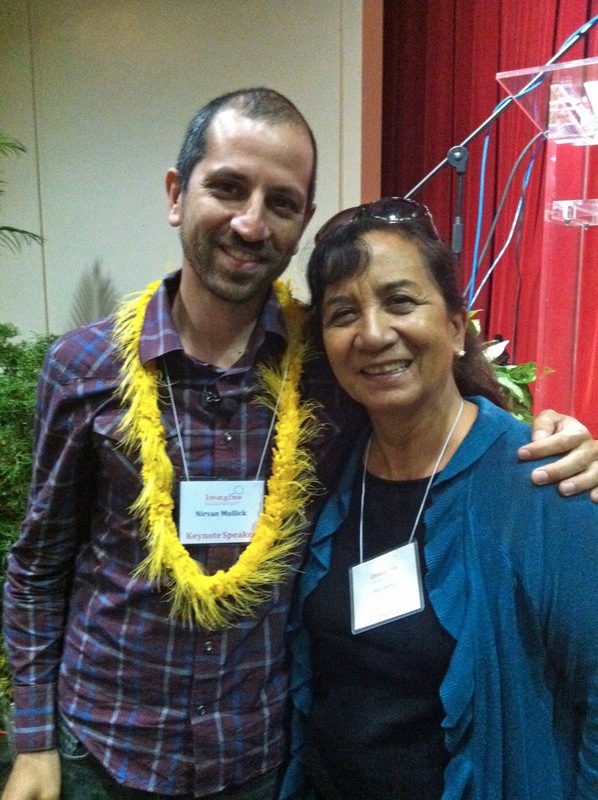 "Carver Wilson of Maui Floral knows firsthand about the hitchhiking pests carried in cut flowers and foliage. He and other florists throughout the state have voluntarily cut back on their use of eucalyptus and wax myrtle as foliage in arrangements. These plants in the myrtle family are imported from out-of-state and are the likely culprit for bringing in the invasive ‘ōh‘ia rust that spread quickly, killing rose apple trees throughout the state." Secondly, the Maui Invasive Species Committee recommends buying or using only locally grown flowers and foliage. I was happy to see that the Starrs documented the puccinia psidii damage again, in 2012. This photo gives a clear idea of the kind of damage we saw a couple of weeks ago. Habit Puccinia psidii damage at Hana Hwy, Maui. Those dead rose apple trees definitely caught my attention! Does anyone know the status of the proposed ban on importing plants that could have a related strain affecting the ‘ōhi‘a? It's important that we find out! P. S. A big MAHALO to Forest and Kim for their dedication to documenting the natural resources of Hawaii. Anyone Up for a Cardboard Challenge, ala Caine's Arcade? The second Cardboard Challenge will take place on October 5, 2013. Find out about hosting a Challenge here. The event could range from a classroom project to a large community event. Cross-posted in mauilibrarian2 in Olinda.